It turned out ok. Definitely wearable. 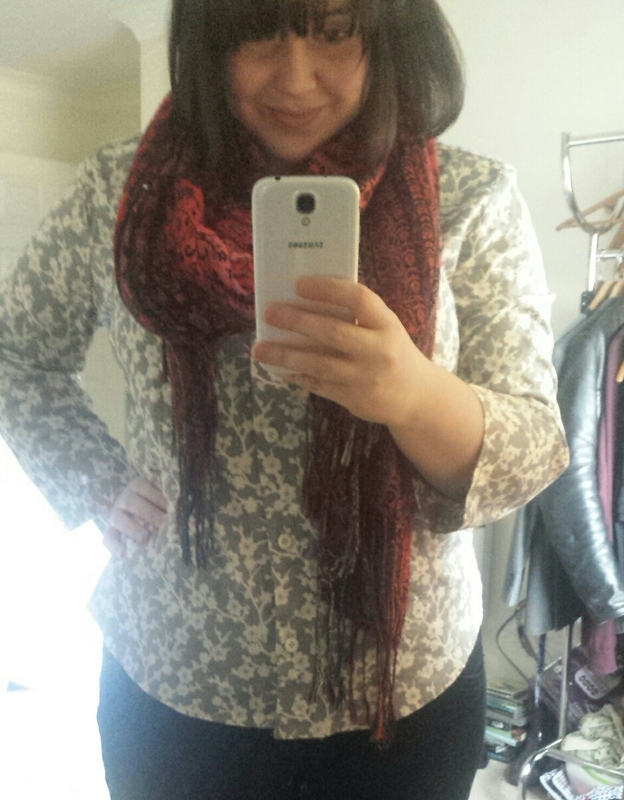 In fact I’m wearing it today with black tights, boots and a big baggy cardigan. The fit is okay and there is a lot of ease so I can sit down comfortably. I was worried as the fabric is very stiff. I messed the zip up due to not reading the instructions properly and having to botch it together. It holds well enough but I know for next time to read the instructions THOROUGHLY! Good pattern and I’ll definitely make another one, but reduce the length and maybe use a thinner fabric. I might line it too, as it will just feel nicer! So it’s the third month of the me made wardrobe challenge and I’ve got two finished garments: the skirt and this shirt which I threw together from another New Look pattern. I’ve got a bit of catching up to do and need to finish the peplum top… which I think I’ve been pretending doesn’t exist. I made three toiles and cant get the fit right. Back to the drawing board! What do you think? Did you make anything this weekend? Your skirt looks great – well done! I love finding bargain fabric, I picked up a huge remnant of jersey in a charity shop for a fiver at the weekend – can’t wait to make a 1950s style wiggle dress from it! You achieved a Great fit skirt! I am trying to draft a skirt. That skirt is a fantastic fit on you and I love the material. I have bought a cheap end of roll cotton, I plan to make a short sleeve blouse. I have trimmed the paper pattern but that’s as far as it’s got today, can’t wait to get on with it tomorrow. Love the skirt! The colour in particular is really nice, but then again I do have a thing for reds and pinks.